The Cav2.1 P/Q voltage-dependent calcium channel is encoded by the CACNA1A gene. Voltage-dependent calcium channels mediate the entry of calcium ions into excitable cells, and are also involved in a variety of calcium-dependent processes, including muscle contraction, hormone or neurotransmitter release, and gene expression. Calcium channels are multisubunit complexes composed of alpha-1, beta, alpha-2/delta, and gamma subunits. The channel activity is directed by the pore-forming alpha-1 subunit, whereas, the others act as auxiliary subunits regulating this activity. The distinctive properties of the calcium channel types are related primarily to the expression of a variety of alpha-1 isoforms, alpha-1A, B, C, D, E, and S. This gene encodes the alpha-1A subunit, which is predominantly expressed in neuronal tissue. Mutations in this gene are associated with neurologic disorders, including familial hemiplegic migraine and episodic ataxia 2. One particular mutation (S218L) which is associated with hemiplegic migraine, ataxia, and seizures, may also confer a vulnerability to life-threatening cerebral edema after a minor head injury. This gene also exhibits polymorphic variation due to (CAG)n-repeats. Multiple transcript variants have been described, however, the full-length nature of not all is known. 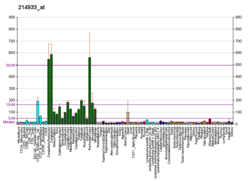 In one set of transcript variants, the (CAG)n-repeats occur in the 3' UTR, and are not associated with any disease. However, in another set of variants, an insertion extends the coding region to include the (CAG)n-repeats which encode a polyglutamine tract. Expansion of the (CAG)n-repeats from the normal 4-16 to 21-28 in the coding region is associated with spinocerebellar ataxia 6. Cav2.1 has been shown to interact with CACNB4. ^ Stam AH, Luijckx GJ, Poll-Thé BT, Ginjaar IB, Frants RR, Haan J, Ferrari MD, Terwindt GM, van den Maagdenberg AM (2009). "Early seizures and cerebral oedema after trivial head trauma associated with the CACNA1A S218L mutation". J Neurol Neurosurg Psychiatry. 80 (10): 1125–1129. doi:10.1136/jnnp.2009.177279. PMID 19520699. ^ "Entrez Gene: CACNA1A calcium channel, voltage-dependent, P/Q type, alpha 1A subunit". ^ Walker D, Bichet D, Campbell KP, De Waard M (Jan 1998). "A beta 4 isoform-specific interaction site in the carboxyl-terminal region of the voltage-dependent Ca2+ channel alpha 1A subunit". J. Biol. Chem. 273 (4): 2361–7. doi:10.1074/jbc.273.4.2361. PMID 9442082. ^ Walker D, Bichet D, Geib S, Mori E, Cornet V, Snutch TP, Mori Y, De Waard M (Apr 1999). "A new beta subtype-specific interaction in alpha1A subunit controls P/Q-type Ca2+ channel activation". J. Biol. Chem. 274 (18): 12383–90. doi:10.1074/jbc.274.18.12383. PMID 10212211. Terwindt G, Kors E, Haan J, Vermeulen F, Van den Maagdenberg A, Frants R, Ferrari M (2002). "Mutation analysis of the CACNA1A calcium channel subunit gene in 27 patients with sporadic hemiplegic migraine". Arch. Neurol. 59 (6): 1016–8. doi:10.1001/archneur.59.6.1016. PMID 12056940. Catterall WA, Perez-Reyes E, Snutch TP, Striessnig J (2005). "International Union of Pharmacology. XLVIII. Nomenclature and structure-function relationships of voltage-gated calcium channels". Pharmacol. Rev. 57 (4): 411–25. doi:10.1124/pr.57.4.5. PMID 16382099. Perez-Reyes E, Castellano A, Kim HS, Bertrand P, Baggstrom E, Lacerda AE, Wei XY, Birnbaumer L (1992). "Cloning and expression of a cardiac/brain beta subunit of the L-type calcium channel". J. Biol. Chem. 267 (3): 1792–7. PMID 1370480. Barry EL, Viglione MP, Kim YI, Froehner SC (1995). "Expression and antibody inhibition of P-type calcium channels in human small-cell lung carcinoma cells". J. Neurosci. 15 (1 Pt 1): 274–83. PMID 7823133. Joutel A, Bousser MG, Biousse V, Labauge P, Chabriat H, Nibbio A, Maciazek J, Meyer B, Bach MA, Weissenbach J (1993). 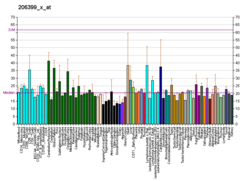 "A gene for familial hemiplegic migraine maps to chromosome 19". Nat. Genet. 5 (1): 40–5. doi:10.1038/ng0993-40. PMID 8220421. Margolis RL, Breschel TS, Li SH, Kidwai AS, Antonarakis SE, McInnis MG, Ross CA (1995). "Characterization of cDNA clones containing CCA trinucleotide repeats derived from human brain". Somat. Cell Mol. Genet. 21 (4): 279–84. doi:10.1007/BF02255782. PMID 8525433. Rettig J, Sheng ZH, Kim DK, Hodson CD, Snutch TP, Catterall WA (1996). "Isoform-specific interaction of the alpha1A subunits of brain Ca2+ channels with the presynaptic proteins syntaxin and SNAP-25". Proc. Natl. Acad. Sci. U.S.A. 93 (14): 7363–8. doi:10.1073/pnas.93.14.7363. PMC 38990. PMID 8692999. Diriong S, Lory P, Williams ME, Ellis SB, Harpold MM, Taviaux S (1995). "Chromosomal localization of the human genes for alpha 1A, alpha 1B, and alpha 1E voltage-dependent Ca2+ channel subunits". Genomics. 30 (3): 605–9. doi:10.1006/geno.1995.1284. PMID 8825650. Ophoff RA, Terwindt GM, Vergouwe MN, van Eijk R, Oefner PJ, Hoffman SM, Lamerdin JE, Mohrenweiser HW, Bulman DE, Ferrari M, Haan J, Lindhout D, van Ommen GJ, Hofker MH, Ferrari MD, Frants RR (1996). "Familial hemiplegic migraine and episodic ataxia type-2 are caused by mutations in the Ca2+ channel gene CACNL1A4". Cell. 87 (3): 543–52. doi:10.1016/S0092-8674(00)81373-2. PMID 8898206. Zhuchenko O, Bailey J, Bonnen P, Ashizawa T, Stockton DW, Amos C, Dobyns WB, Subramony SH, Zoghbi HY, Lee CC (1997). "Autosomal dominant cerebellar ataxia (SCA6) associated with small polyglutamine expansions in the alpha 1A-voltage-dependent calcium channel". Nat. Genet. 15 (1): 62–9. doi:10.1038/ng0197-62. PMID 8988170. De Waard M, Liu H, Walker D, Scott VE, Gurnett CA, Campbell KP (1997). "Direct binding of G-protein betagamma complex to voltage-dependent calcium channels". Nature. 385 (6615): 446–50. doi:10.1038/385446a0. PMID 9009193. Qin N, Platano D, Olcese R, Stefani E, Birnbaumer L (1997). "Direct interaction of gbetagamma with a C-terminal gbetagamma-binding domain of the Ca2+ channel alpha1 subunit is responsible for channel inhibition by G protein-coupled receptors". Proc. Natl. Acad. Sci. U.S.A. 94 (16): 8866–71. doi:10.1073/pnas.94.16.8866. PMC 23172. PMID 9238069. Riess O, Schöls L, Bottger H, Nolte D, Vieira-Saecker AM, Schimming C, Kreuz F, Macek M, Krebsová A, Klockgether T, Zühlke C, Laccone FA (1997). "SCA6 is caused by moderate CAG expansion in the alpha1A-voltage-dependent calcium channel gene". Hum. Mol. Genet. 6 (8): 1289–93. doi:10.1093/hmg/6.8.1289. PMID 9259275. Jodice C, Mantuano E, Veneziano L, Trettel F, Sabbadini G, Calandriello L, Francia A, Spadaro M, Pierelli F, Salvi F, Ophoff RA, Frants RR, Frontali M (1997). "Episodic ataxia type 2 (EA2) and spinocerebellar ataxia type 6 (SCA6) due to CAG repeat expansion in the CACNA1A gene on chromosome 19p". Hum. Mol. Genet. 6 (11): 1973–8. doi:10.1093/hmg/6.11.1973. PMID 9302278. Charvin N, L'evêque C, Walker D, Berton F, Raymond C, Kataoka M, Shoji-Kasai Y, Takahashi M, De Waard M, Seagar MJ (1997). "Direct interaction of the calcium sensor protein synaptotagmin I with a cytoplasmic domain of the alpha1A subunit of the P/Q-type calcium channel". EMBO J. 16 (15): 4591–6. doi:10.1093/emboj/16.15.4591. PMC 1170085. PMID 9303303. Ishikawa K, Tanaka H, Saito M, Ohkoshi N, Fujita T, Yoshizawa K, Ikeuchi T, Watanabe M, Hayashi A, Takiyama Y, Nishizawa M, Nakano I, Matsubayashi K, Miwa M, Shoji S, Kanazawa I, Tsuji S, Mizusawa H (1997). 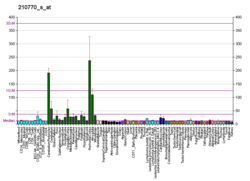 "Japanese families with autosomal dominant pure cerebellar ataxia map to chromosome 19p13.1-p13.2 and are strongly associated with mild CAG expansions in the spinocerebellar ataxia type 6 gene in chromosome 19p13.1". Am. J. Hum. Genet. 61 (2): 336–46. doi:10.1086/514867. PMC 1715894. PMID 9311738. Walker D, Bichet D, Campbell KP, De Waard M (1998). "A beta 4 isoform-specific interaction site in the carboxyl-terminal region of the voltage-dependent Ca2+ channel alpha 1A subunit". J. Biol. Chem. 273 (4): 2361–7. doi:10.1074/jbc.273.4.2361. PMID 9442082. Yue Q, Jen JC, Thwe MM, Nelson SF, Baloh RW (1998). "De novo mutation in CACNA1A caused acetazolamide-responsive episodic ataxia". Am. J. Med. Genet. 77 (4): 298–301. doi:10.1002/(SICI)1096-8628(19980526)77:4<298::AID-AJMG9>3.0.CO;2-J. PMID 9600739. Hans M, Urrutia A, Deal C, Brust PF, Stauderman K, Ellis SB, Harpold MM, Johnson EC, Williams ME (1999). "Structural elements in domain IV that influence biophysical and pharmacological properties of human alpha1A-containing high-voltage-activated calcium channels". Biophys. J. 76 (3): 1384–400. doi:10.1016/S0006-3495(99)77300-5. PMC 1300117. PMID 10049321. Walker D, Bichet D, Geib S, Mori E, Cornet V, Snutch TP, Mori Y, De Waard M (1999). "A new beta subtype-specific interaction in alpha1A subunit controls P/Q-type Ca2+ channel activation". J. Biol. Chem. 274 (18): 12383–90. doi:10.1074/jbc.274.18.12383. PMID 10212211. This page was last edited on 23 September 2018, at 02:19 (UTC).